Most enjoyable weekend catching up on a few movies that I had failed to see while in wide release at the cinemas. I was quite happy with Flight. Top notch story telling, which plodded along nicely in full character development fashion. Being witness to people celebrate and then unravel is true to the 'people-watcher' fancy that most of us humans have come to enjoy. This film offers us such voyeurism. 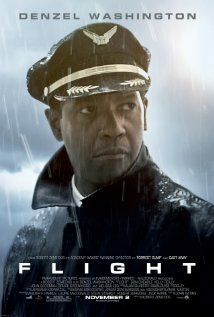 While watching Flight I came to a conclusion about Denzel Washington. As a humble, flawed character he is much more interesting. Never to shy away from difficult or controversial characters I feel he shines best when burdened with humility and human dilemnas (man vs. himself conflict). I also very much enjoyed Kelly Reilly who was as beliveable of a addict as I have ever seen. This is ever more impressive when you consider that the majority of her screen time was in recovery. The movie ran a lengthy 138 minutes, ample time to get Whip Whitaker's story told in fair unbiased representation. A strong 7.5 out of 10.